An ecommerce platform made just for you. Whether you sell online, on social media, in store, or out of the trunk of your car, Shopify has you covered. Selling your products in many places should be every bit as simple as selling in one. With Shopify, you get one unified platform to run your business with ease. 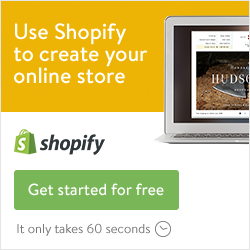 Try Shopify free for 14 days. No risk, and no credit card required. Your products are displayed in an online catalogue that you can organize by category, so they’re easy for customers to browse and always look their best. Shopify fits your business, whether you’re a mum-and-dad shop, a weekend crafter, or a big brand name. There’s no limit to the number or type of products you can sell in your online store. From Bitcoin to PayPal to iDEAL, we integrate with over 70 external payment gateways from around the world. All pages, content, credit card, and transaction information is protected by the same level of security used by banks. Shopify is certified Level 1 PCI compliant.